Winter seems to have taken a momentary break and given us a couple of days of sunny, warm weather—and shrinking snow patches. Cheoah on the hunt for one of the shrinking snow patches. After days of not getting above freezing and brutal winds, Mother Nature decided to give us a couple of warm, sunny days. It has felt downright spring-like outside which has been great, except for our melting snow. We have more grass than snow in our yard now, but we can still hunt for the good spots. Boom Boom joins Cheese for some snow. No matter what the groundhog saw yesterday (and if he had been in our yard, he would have only seen us coming for him), we don’t expect winter is over. Still, it’s important to enjoy snow while it lasts. 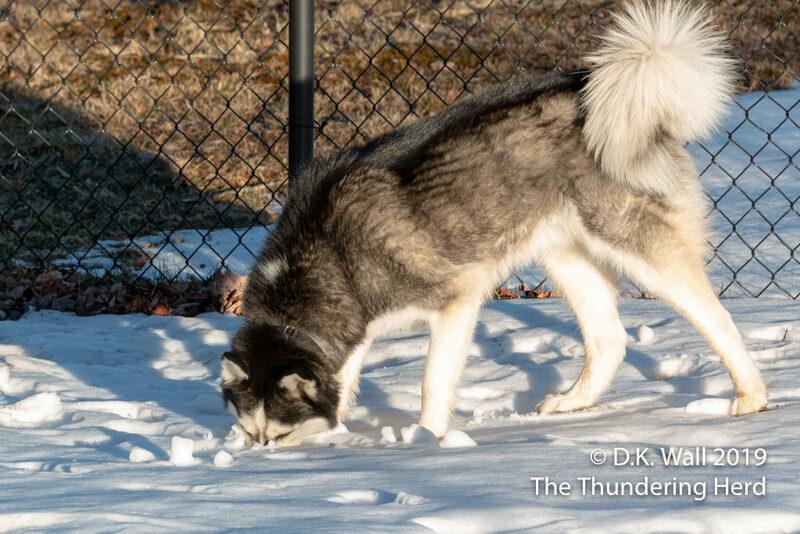 Of course, for a Siberian Husky, that means bury yourself in it. Oh, that feels good on the snooter. “He would have seen us coming for him” ….. that brought quite the mental image to me! Luckily I had swallowed the sip of coffee, or the Herd would owe me a new laptop. Me too Don-the thought of the dogs “getting” the groundhog ISN’T pretty! YUCK. I hadn’t yet picked up my coffee cup so damage there. 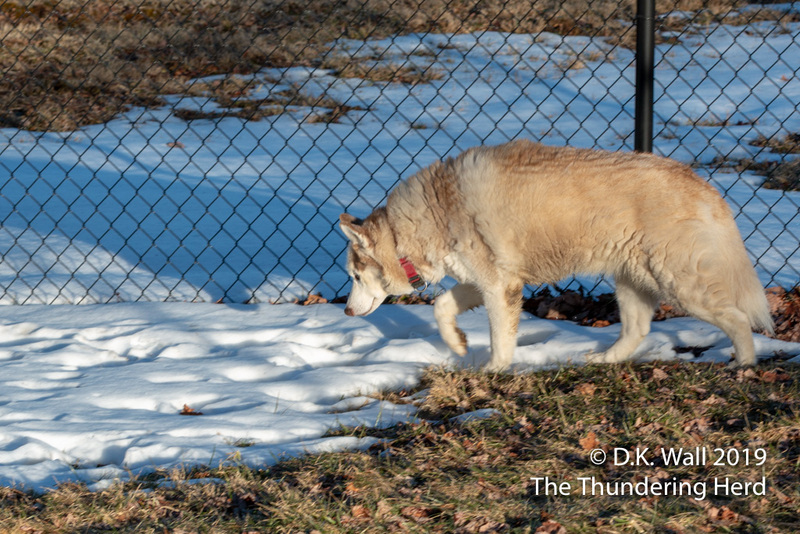 Where I live there is more ice than snow so our boy Bradley has to enjoy our fenced in yard rather than go for his walk. Mom doesn’t want to take a header on the street! That brings back memories of my Sibe,Rory,in her younger days…she killed (+ ate 😲) 2 woodchucks! Within a 2 week period! She was about 3years old,and in the “prime” of her hunting prowess.Thankfully,her “kills” have become much less now- an occasional mole or field mouse!! 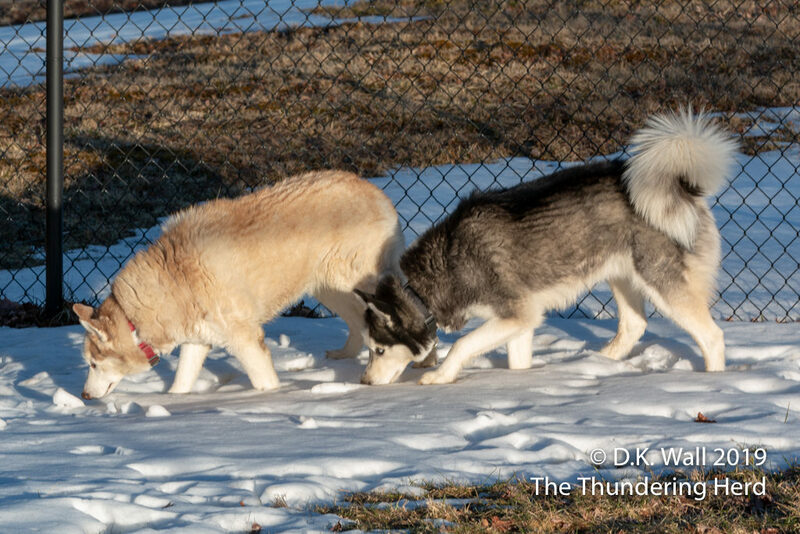 Huskies give us a close look at Nature!! We have caught quite a few of those groundhogs. We are doing our best population control (wouldn’t want the cows and goats to fall in the holes they dig). We went after one with Mom still attached to our leashes. For some reason she was on the ground making us drag her, that really slowed up the chase. When we finally got her loose That groundhog didn’t stand a chance. Mom says she’s still can feel the road rash. Hu-Dad grimaced, but we think it’s a great story! I thought groundhogs were supposed to hiberate in Michigan here but my dog grabbed a small one 4 days after her spay surgery here. It was a cold blustery day not above 20 degrees so not sure why he was out. I managed to get my dog to drop it after two shakes so hopefully it was okay. I like groundhogs but my dogs think anything that moves is fair game. how fast the snow disappears!